all the above for less than $4 tax included. "Paradise Pup in Des Plaines"
Last edited by Sweet Willie on September 6th, 2007, 11:56 am, edited 1 time in total. Good choice. Don't forget dark rye as a burger option, and that you can get either battered/seasoned (bleah) or non-seasoned (yeah) fries. I have always wanted to go to Paradise Pup. Now it is on my must-do list. I was there last Saturday (for the first time) and absolutely loved it. I heartily second this nomination. It's at the very top of its genre. This is one of the places that I had on my short list of potential nominees. If no one else nominated PP, I probably would have. Great food served up in a family owned and operated location. In addition to the already mentioned burgers and dogs, PP also serves up an excellent version of a chicken breast sandwich (breasts marinated overnight, then grilled over charcoal). The shakes are great, too. They feature (among others) Oreo shakes, which seem to be a favorite. But for me the chocolate-banana shake is my go to flavor. This is a great nomination that I enthusiastically endorse. A resounding yes on the cheddar-burger on the dark bread. It even travels well, in another thread I mentioned that I drove 28 miles home with it wrapped up, and it was just fine. I'm not a big fan of any of their fries, but that's ok. Paradise Pup is my go-to place if I have a flight out of O'Hare around 4-5pm and want a late lunch. So I don't mind it being a one-trick-pony for me, because it's a very nifty trick. Ramon wrote: You beat me to it. Thanks for the links Ramon!! Very deserving nomination and long overdue. For me it's all about the burger, which I enjoy with everything including grilled and raw onions. I haven't come across another "stand", serving this style of burger, which comes close to the taste, quality and freshness of the Pup's. (Okay maybe Poochies but I haven't been in a long while.) Others rave about the char chicken and dogs but I'm loyal to that burger. There are long lines and annoying phone orders also being prepared during the lunch crunch but they now have the extended closing hour of 5.00 P.M. Adding to the neighborhood feel are the outdoor picnic tables, some about 5 feet away from the roar of traffic on River Road. Once the weather turns you'll be eating in your car, so bring a newspaper to help soak up the wonderful overflowing juices that are too much for the wrapper. Everyone seems to have at least one place in the Chicago area where they're always willing to stand in line for what would normally seem an unreasonable amount of time, because they know the food they'll be getting in the end is worth it. For some it's Hot Doug's, for others it's Kuma's - for me it's Paradise Pup (though the worst wait I've had is 40 minutes in peak hours on a perfect summer day). A double char burger with the Merkt's cheddar on black bread, fries with Merkt's cheddar and bacon, and a chocolate-banana shake with the banana peeled and sliced up right in front of you and thrown in has to be one of my absolute perfect meals. One of my favorite burgers, particularly on the black bread. And the shake transports me every time - with the fresh banana it somehow manages to taste just like a liquid version of the banana Nutella or banana chocolate crepes that I enjoy on the streets of Paris. PP Rules! Even with all of the acclaim that the national fast food burger chains are getting around here lately, not one of them can touch Paradise Pup's char burger. Even the marinated chicken breast sandwiches are pretty good; and how about those shakes! Paradise Pup is one of the few places that I will actually stand in line for. It's a GNR is every sense of the word. Renewal? Of course. I just had a glorious PP burger a couple of weeks ago. The burger was perfect. The chocolate banana shake was great. The fries were about as boring as they come. I very much hope PP is renewed. Great burger (gotta love Merkts), and unlike Darren, I found the fries to be outstanding -- crisp crinkles. Also good shakes. Not in my neighborhood, but still great. Cheddar burger for the win. I am stuck in a rut - whenever I have to be near O'Hare during the day, and it happens at least once a month - I arrange it so I can get a cheddar burger on rye, grilled onions, hold the mayo. Not only is it great, but at this point it is easily my single favorite hamburger in the world. Tamale and char dog are also very good, fries just serviceable, but I do love PP's burger. ucjames wrote: Everyone seems to have at least one place in the Chicago area where they're always willing to stand in line for what would normally seem an unreasonable amount of time, because they know the food they'll be getting in the end is worth it. For some it's Hot Doug's, for others it's Kuma's - for me it's Paradise Pup (though the worst wait I've had is 40 minutes in peak hours on a perfect summer day). A double char burger with the Merkt's cheddar on black bread, fries with Merkt's cheddar and bacon, and a chocolate-banana shake with the banana peeled and sliced up right in front of you and thrown in has to be one of my absolute perfect meals. My thoughts on Paradise Pup remain exactly the same now as they did in 2009. 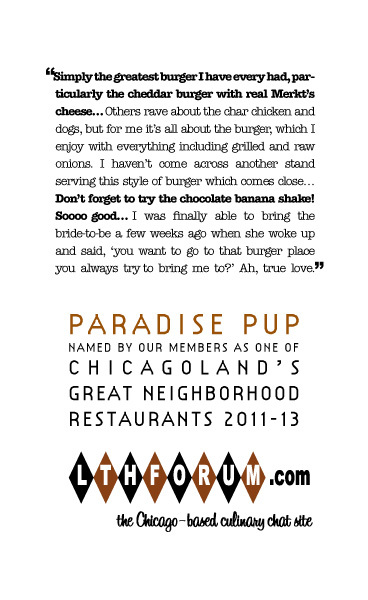 On trips back to Chicago this year my biggest regret was that my flights back always got in a few hours before Paradise Pup opened, so I couldn't get a burger and shake while I was nearby. So I just had to make some out of the way trips instead. Some nice recent support for the Pup in this thread here: http://www.lthforum.com/bb/viewtopic.php?f=14&t=37917. stevez wrote: PP Rules! Even with all of the acclaim that the national fast food burger chains are getting around here lately, not one of them can touch Paradise Pup's char burger. Even the marinated chicken breast sandwiches are pretty good; and how about those shakes! Paradise Pup is one of the few places that I will actually stand in line for. It's a GNR is every sense of the word. Renewal? Of course. Please see my previous comment. I still feel the same. Although Rand Redhots and Boston Fish Market are getting some of my Des Plaines love these days, I still visit the Pup regularly. Calvin Trillin once said that anyone who doesn't think the best burger in the world is in their hometown is a sissy. While I disagree with the name calling, this place is my answer. As my nearest current GNR, and as the makers of burgers which are not just a close favorite in my mind, but on almost another tier of hamburgerness, I have to support renewal enthusiastically. I go here on average once a month, and the quality has never flagged. The only problem with the place is that there are lines occasionally and I have to wait for my cheddar burger a little bit longer. To me it is the quintessential version of the Chicago char burger that many hot dog type joints do. I've only been there twice, but both visits were so memorable that I always want to go back when I am in the area. In fact, I did make an attempt to go there last Sunday, but they are closed Sundays. While that was very annoying, I know that it is a family operation and they want to be there making sure everything is perfect. That shows me they care about what they serve and always makes them a contender for a GNR. They could have easily coasted on their Diners, Drive-Ins, and Dives attention, but they didn't. It would be nice if they could open a much larger place, they certainly would do even more business, but for now, this is it. When I took a friend of mine to O'Hare, we stopped at Paradise Pup. The first thing he posted on Facebook when he landed was about the burger he loved at Paradise Pup (and his posting wasn't for me, it was for anyone he is friends with). Ram4 wrote: It would be nice if they could open a much larger place, they certainly would do even more business, but for now, this is it. I'd like to see one very simple way (in my opinion) to speed up the line, ask the next person in line or even next two people in line, what they are ordering. There always seems to be plenty of room on the grill & prep area to accept more orders. Granted if a person has just placed an order for 8 burgers this may not be the case but this waiting until the customer is in front of the counter when most are placing orders of 1 or 2 items does not seem very efficient. I actually did have an overcooked burger at PP a few months ago, but thankfully that seems to have been a one off. I'm actually amazed living so close, that I don't go to PP more than every other month, not that I don't crave their burgers, I do, but I'm trying to get in some kind of decent physical shape. Ram4 wrote: I'm actually amazed living so close, that I don't go to PP more than every other month, not that I don't crave their burgers, I do, but I'm trying to get in some kind of decent physical shape. No excuse! I actually won a burger and fries for a year at Tom and Eddie's and lost 35 pounds over 4 months while eating there every week (and I'd get 1/2 pound burger with bacon sometimes). Granted I didn't eat like that every day, but I definitely ate that every week and I still lost weight. Sorry, portion control and exercise did have a role in this for most other days if you want the proper context!